A little over six months after first being announced (last100 coverage), LimWire’s DRM-free music download store has finally opened for business. The U.S.-only store currently has a catalog of 500,000 tracks, with thousands more to be added “daily”. All music is offered as MP3s encoded at 256 kbps and priced a la carte at 99c per track. Additionally, LimeWire is offering pre-paid plans similar to eMusic, ranging from $9.99 per-month for 25 downloads (40c per track) to $19.99 per-month for 75 downloads (27c per track). Despite being at least six months in the making, the LimeWire music store is a purely Web-based affair and doesn’t yet tie into the LimeWire P2P client. 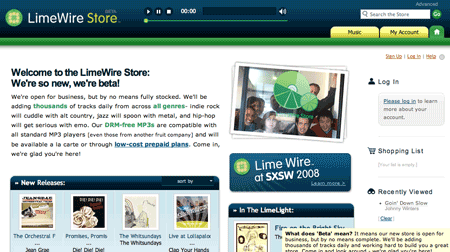 On that note, LimeWire says that in the future it “will be releasing a version of our file-sharing software optimized for integration with the Music Store.” That way, LimeWire can begin to leverage its, albeit shady, brand recognition amongst music down-loaders in an attempt – like Napster before it – to develop a legitimate business in the onlooking eyes of the music industry. All in all, Limewire is entering an increasingly crowded market with very little distinction beyond its name and pre-paid pricing, that includes big hitters Apple, Amazon and eMusic, as well as other recent DRM-free converts such as Wal-Mart — see our Digital music: 2007 year in review. Lime Wire has jumped onto the crowded DRM-free bandwagon and entered the legal music download market. Customers in the US get the first bite out of the new music service, with an international rollout promised in the near future. I was waiting for this feature so long, cant believe that its finally available! Thank You! Thank you so much for this limewire pro release!